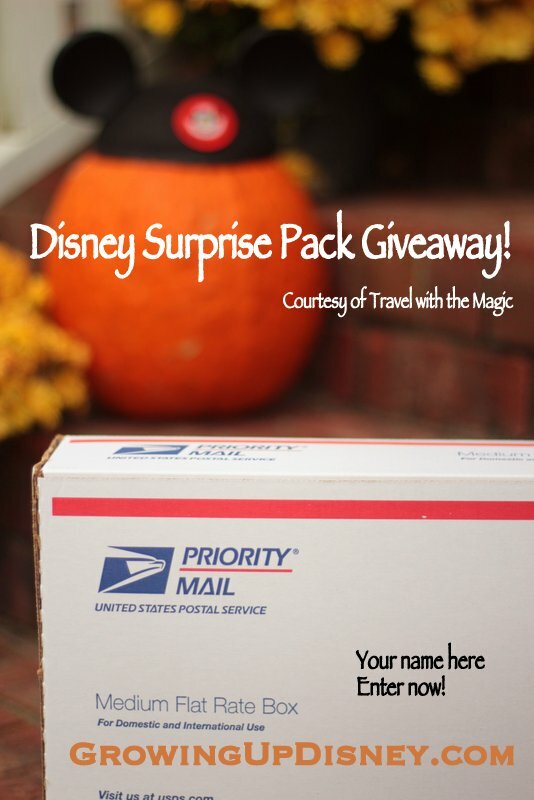 Growing Up Disney: Disney Surprise Pack Giveaway! My buddy, Kelly from Travel with the Magic, has sent me a box of goodies to share with one lucky Growing Up Disney reader. There is lots of fun stuff in here and we've kept the entries simple, so ENTER NOW! With access to all the latest Disney discounts and specials, Travel With The Magic® will create your dream vacation at your dream price. All of our Disney vacation planning services are FREE! We offer personal concierge services such as itinerary planning, discount monitoring, handle dining reservations, book excursions, transfers, and so much more! We are continuously checking Disney discounts so that we can offer you the best value for your vacation dollar. If a better deal is released we will work to have that code added to your existing reservation. All of our Disney Destination Specialists are College of Disney Knowledge graduates and have years of Disney travel experience. If you need pricing for a Magical Disney Vacation, please fill out our quote form for a free, no-obligation quote. Choose us and let’s add some MAGIC to your vacation! My "must-have" Disney souvenir is usually something for my kitchen. It might be a coffee mug, or a magnet, or even new dish towels. usually a coffee mug!! mu cupboards are overflowing. LOL! We are planning our first trip for October 2013, but I definitely want to get Mickey Ears, of course! Every year we purchase each of the kids a Disney Christmas ornament that commemorates a special moment in the parks, whether it be about magical character encounter, a first time experience on an attractions or anything that stood out on our vacation. Decorating our tree then becomes so special as we reminisce about each ornament and why it is special. I always buy a Christmas ornament. Ooooh! So hard to decide!! Bags!! Big messenger bags where I can fit my sketchbooks!!!! My "must have" Disney souvenir is exclusive park trading pins! I love the pins and can't wait to do some trading with cast members! We get a Christmas ornament every time we go. But, a new stuffed animal for the kids is also a must have. Awesome! Thanks for the giveaway! I love to bring home anything kitchen related. My must-have Disney souvenir is probably a t-shirt. I try to get one everywhere I go! I have 3: WDW snowglobe for my desk at work, a photo refrigerator magnet that holds a pic of my grandson at the MK, and I love bringing home the delicious chip and dale pretzels. Must-have souvenir? Hard to pin down just one, depends on my mood--but some of my faves include: a WDW snow globe for my desk at work (kitschy I know, but so cute). a photo refrigerator magnet to hold the pic of my grandson at the MK. and no trip to WDW is complete without returning home with a big bag of the Chip and Dale pretzels. Disney Pins, Amy! Great contest! My must have souvenir is a pressed penny from one of the attractions and the popcorn buckets. This year we have started collecting pressed pennies!! A stuffed Disney Character is my must have souvenir! Thanks! I always get a t-shirt or a hoodie AND something for my kitchen. Cookie cutter, pizza cutter, oven mitts, etc. I've been buying a photo album on each trip, and a new picture frame. Must have and my absolute favorite every trip is a photo with the family in front of the castle!! My must have is always a t-shirt. I am always scouting out my next addition. My must-have Disney souvenir is one of the souvenir cups I can use repeatedly at home. They make great water bottles for around the house and my son loves sharing them with me! My must-have souvenir is a souvenir cup. They make great water bottles around the house and my son loves sharing them with me! My must have Disney treasure each trip is new pins. My family loves pins! I usually try to get a few new pieces of Disney jewelry ~ usually Mickey Mouse shaped! Must have a new Vinylmation everytime! my must have is a Christmas ornament and a tshirt!!! Just found the blog. Thanks for all the useful info. We are planning a trip for next Nov. It is far away but that gives me plenty of time to catch up with all of your blog posts. Park Maps are a must and my son gets a t-shirt with the year on it! My must have souvenir right now is trading pins..but soon will be collecting Christmas ornaments! Jewelry - I like the beads from recycled park maps and such. Have to get park maps and Mickey ears. The ornament's at Disney are very nice. I also like collecting pins from the parks and a fleece blanket. I have not been since I was 4 yrs old (36 yrs ago); but ANYTHING Disney is GREAT!! pressed pennies,& anything with Disney on it. Must have would be a Christmas tree ornament or another Tink mug ! Must have is a Christmas ornament or a Tink mug or a charm for my bracelet. disney is my life. i have grown up with it, and still to this day i watch at least one disney movie a day. i just do not understand how it is possible for someone not to like disney. it isnt. i honestly cannot be friends with those people.